Creating Forever Bonds Course: %10 Discount! Happy New Years everyone! The Aspirations family hopes your holidays were fantastic and also hope you’re ready to take on the New Year. Since this time of year brings out a lot of resolutions in many people, we are offering an overall %10 discount for the month of January, off our 8 week Creating Forever Bonds Course (a saving of $76). 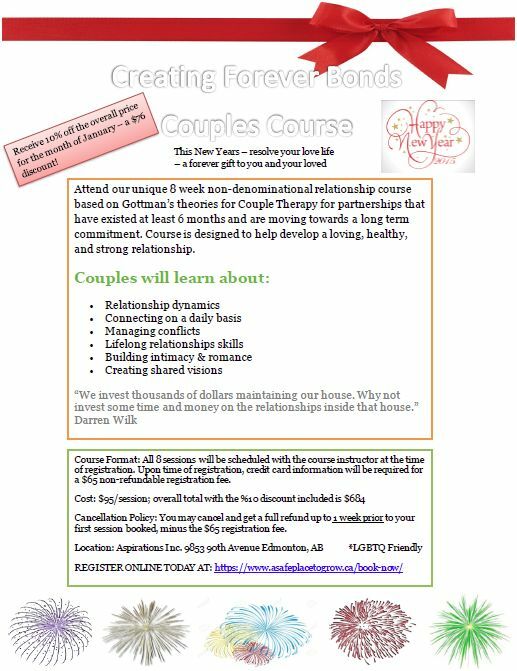 Any couples wanting to take this course and get a start on a better love life please take a look at the poster above and begin your intake online! This year, let Aspirations help your marriage blossom into it’s full potential.